Terms: $5,000.00 down the day of auction in certified funds w/balance at closing. Closing held on or before 45 days. Possession upon receipt of down payment for farming purposes. Have finances ready, selling with immediate confirmation. No Buyer’s Premium. All information was derived from sources believed to be correct but not guaranteed. Dimensions are approximate. Buyers need to rely entirely on their own judgment and inspection of property records. Any other terms & conditions will be announced the day of the auction and take precedence over printed material. WEDNESDAY FEBRUARY 13, 2019 @ 11:00a.m. Directions: Frontages on Co Rd U & Co Rd T3 between Co Rd 2 & 3. 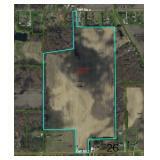 57.68+/- Acres-Henry County Farm! 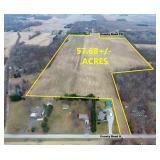 Great building or hobby farm opportunity in Washington Twp & Liberty Center School district with frontages on 2 roads. Walking distance to the Log Cabin Tavern and close to Wabash Cannonball trail and State Forest! See whalenauction.com for drone photos, video & flyer!